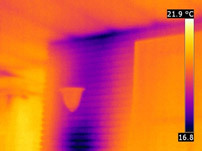 How MyHEAT’s technology is helping homeowners detect home heat loss. Imagine if you could see an aerial map of your home that showed you how much heat you were losing. Emily Mertz from Global News Edmonton explains. 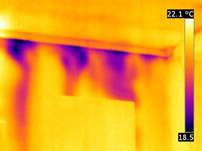 In all cases, investigation revealed potential thermal and air tightness issues that correlated to warm areas in Heat Loss Maps. 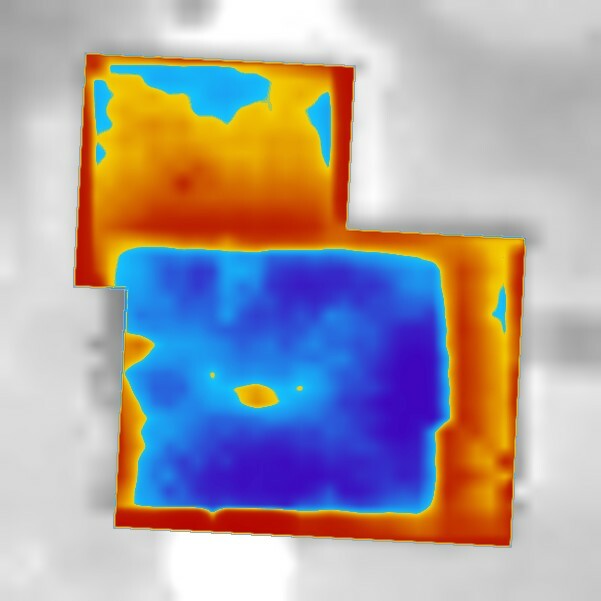 Poorly sealed attic hatches, plumbing stacks and poorly sealed mechanical chases all appear to match locations on the MyHEAT image. 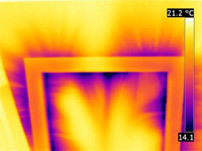 On the least energy efficient homes, the Heat Loss Map provided the most relevant information. More areas were identified that also correlated to Heat Loss Maps in more efficient homes. The outline of the heated footprint was noted as including unheated spaces such as garage and covered entries while missing heated spaces such as sun rooms. Homes with the original attic insulation were more likely to have no other improvements or upgrades. Since attic insulation is one of the simplest and least costly upgrades, it is often completed before other improvements such as windows, or furnaces. 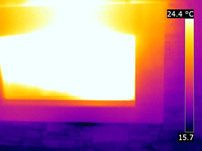 Note: Heat Loss Maps show red as hot, and blue as cold. 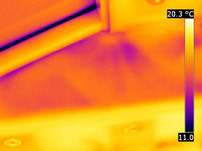 The handheld IR images show white and yellow as hot, and purple and blue as cold. Here are some of the highlights relating to each home’s energy efficiency evaluation. Select (touch_app) a hot spot to see the handheld IR image from that location. Chimney: Openings for flue and combustion air creates a very large area of thermal loss, both through thermal bridging in areas with no insulation and air leakage. This is suspected to be a large area of energy loss. 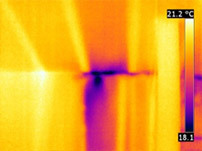 Entry Way: Change in thermal pattern after applying testing pressure showed potential connection between house and garage. 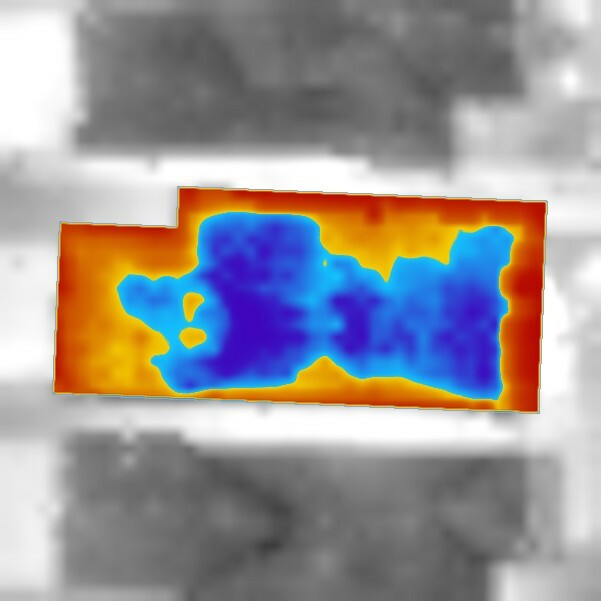 Heated Sun Room: Although not included in the Heat Loss Map, this area is all glass and includes an older patio door that showed strong leakage at weather-stripping during testing. Moreover, the connection of sun room framing to the house appears to be not fully air tight. Attic Hatch: Large leakage area noted around the attic hatch and the trim that surrounds it. This would allow large amounts of warm humid air to pass during the winter, which can lead to dampness that promotes mold growth as suspected on the insulation blocking around the opening. Garage Wall: Suspected poorly sealed connection between wall and floors that separate house from garage. This would result in additional energy loss and risk of durability issues. Garage Wall: Wall between house and garage is showing areas of air leakage. Under normal conditions, this warm air will travel up the plumbing and electrical penetrations, laundry vent and into the garage attic. Fireplace: Replacement gas insert showing strong leakage around edge—indicating poor seal of new unit to the existing chimney. Combined with warm house air leaking up chimney, this creates large heat loss here. Mechanical Vent: Metal B-vent is unsealed and leaking strongly. Warm house air will rise up this chase wall, which is unsealed at the attic level. Plastic side venting furnace vents also appear to be unsealed. 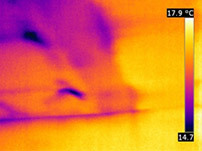 Living Room: Poorly fit insulation and heavy thermal bridging creates cold area along living/dining room ceiling. This area shows suspected air leakage after testing air pressure applied. In the individual case studies for each home, MyHEAT’s Heat Loss Maps provided helpful information. 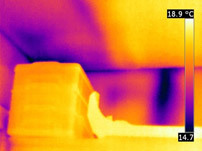 They showed a vantage point not available from the ground for thermography and contributed a “bird’s eye-view” to assist in the review of the home energy efficiency. This adds important value for Thermographers and Energy Advisors in providing an accurate energy efficiency evaluation (as possible) to the homeowner. Through the energy efficiency evaluations of these homes, a wide range of performance was assessed. 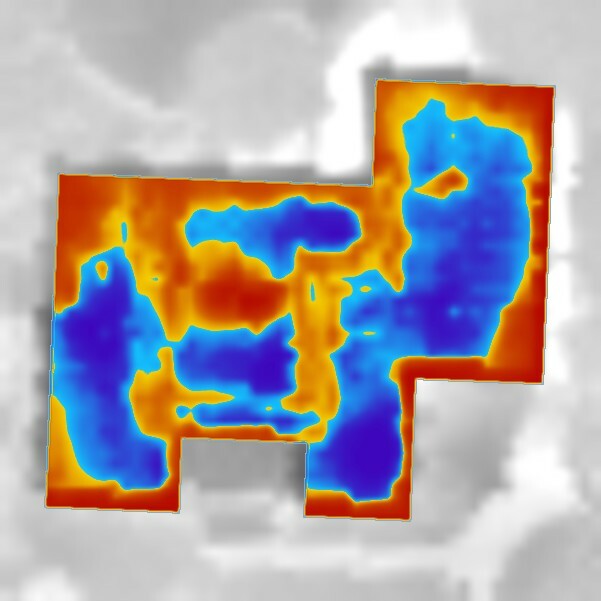 The Heat Loss Maps supported and reinforced findings based on the blower door testing, thermography and the energy advisor’s own knowledge of construction over various ages of homes. Even the most efficient home of the sample benefited from the review in finding construction weaknesses that were allowing higher than acceptable humidity to accumulate in the attic. Clearly the older, least upgraded homes have the most opportunity for energy savings. As attic insulation is typically one of the first upgrades made on older homes, an understanding of the attic insulation provides a key indicator of the overall efficiency of the home. In the least upgraded homes, there was stronger relationship between the findings of the evaluation and major indicators from Heat Loss Maps. Interested in reading more? Contact us to request the full report for this case study. Energy audits for these homes were conducted by 4 Elements Integrated Design.